A few days ago, Sister Connection’s Burundian staff and I visited Godeliva, a widow who is now one of our social workers. Godeliva was one of the first widows sponsored through Sister Connection. By the love and provision of both Christ and her sponsors, she found healing and dignity, so that at the end of 2014 she was able to graduate from sponsorship. When the group of us got to her home, we discovered that Godeliva had recently adopted a young girl named Divine Kwizerimana. At just 11 years old, Divine has experienced a profound amount of pain. Some time ago, Divine’s mother abandoned her family. When her father remarried, Divine and her three siblings suffered under their step-mom’s mistreatment. By the time she was in third grade, she had dropped out of school. When Divine decided couldn’t take it anymore, she fled the only home she knew, and went to live with her aunt. However, her situation there didn’t improve. She continued to be mistreated, this time by her aunt. For the second time in her young life, Divine’s neglectful family forced her to leave the little help she had. Leaving her aunt’s house with nowhere to go, Divine walked and walked. After quite some time, she became tired and sat down… Right in front of Godeliva’s home. That’s where Godeliva found her, tired and downcast. Immediately, Godeliva took her in. Then hearing her story, invited her to stay together with her own children. 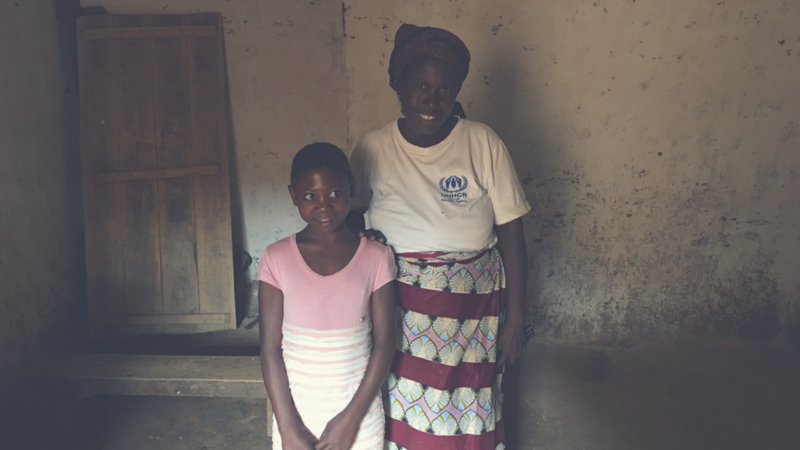 Not only is Godeliva providing food and shelter, she is planning to register Divine for school in order continue her education. Godeliva received much love from her sponsors and I believe the eagerness with which she offered love to Divine reflects that. Ultimately, reflecting God’s love. Although she has little, the little she does have, she shares generously with those who have even less. She set her own conveniences and needs aside to care for another. “This is how we know what love is: Jesus Christ laid down his life for us. And we ought to lay down our lives for our brothers and sisters.” What a great lesson Godeliva can teach all of us. Christ’s love changes hearts every time that it becomes real to our experience. Through changed hearts, Christ’s love spreads. I think this is how the sustainable restoration of Burundi will take place. How exciting (and humbling!) that God invites us to be a part of this story of hope!